A father discovered he had been grieving for his daughter at the wrong grave for 30 years because of a misplaced headstone. George Salt's daughter Victoria died less than two days after being born in July 1988 and was buried at Southern Cemetery in Manchester. Mr Salt said he felt "let down" that he found out by being faced with an empty spot where the gravestone had been. Manchester City Council apologised for the distress he has suffered. Mr Salt, who has visited the grave twice a year for 30 years, said: "I looked down and was completely gobsmacked. I thought 'where's the stone gone?'." He then found the headstone, which marks a public grave containing the remains of Victoria and 16 others, in a different spot. 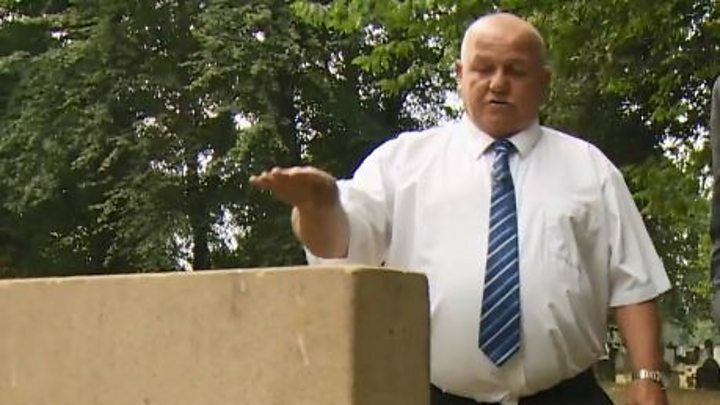 The stone had been moved in error during the 1980s to a vacant plot, but the mistake was only discovered this year when cemetery workers checked records and moved it to the correct place. "I just wasn't told. I feel so let down," Mr Salt said. "When you go to a grave, you sit and talk and say what your troubles are but the annoying thing is you're talking to a piece of ground where she isn't there." The council said they accepted something clearly went wrong in the 1980s and had offered "sincere apologies" to Mr Salt for the distress he has suffered. The passing of time meant they were unable to say why it was moved to the wrong plot, the authority added.